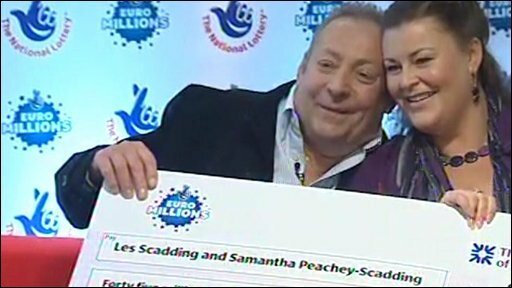 Les Scadding and Samantha Peachey-Scadding: "You just don't know what to do with it"
A married couple from south Wales who won £45.5m on the Euromillions lottery have spoken of how it was "a very funny couple of minutes" before it sank in. Les Scadding, 53, an unemployed mechanic, and wife Samantha Peachey-Scadding, 38, from Caerleon, said they had to double check their ticket. The second ticket is held by a syndicate of Liverpool IT workers called the "Magnificent Seven." Each of the Hewlett Packard employees has banked £6.5m. The syndicate, which only formed four months ago, includes John Walsh, 57, James Bennett, 28, Sean Connor, 32, Alex Parry, 19, Emma Cartwright, 23, Ceri Scullion, 35 and Donna Rhodes, 39. When Mr Walsh phoned the syndicate on Sunday morning to pass on news of their win, they thought he was calling to tell them they had been made redundant. "Thankfully I got to tell them some good news instead," he said. Mr Scadding has been out of work since last Christmas and was £68 overdrawn on his bank account on the day he bought the ticket. Ceri Scullion: "I just thought this doesn't happen to people like us"
He discovered they had won the jackpot after going to a Tesco supermarket in Newport, South Wales, on Saturday evening. He told a news conference: "When I asked the people behind the counter to check the numbers the machine just printed out a pink slip telling me to contact Camelot. "I thought I might have won around £50,000 and I rushed home to tell Samantha." After double-checking online, he said: "It was a very funny couple of minutes. We just looked at each other while it sunk in before we got on the phone to Camelot." They celebrated over Sunday lunch with Mrs Peachey-Scadding's mother in their favourite restaurant, the Priory in Caerleon. Mr Scadding said: "We always go to the Priory, as I know the owner really well, so we wouldn't have gone anywhere different. "We ordered a couple of bottles of champagne and just had a quiet chat about it all, and tried to let it all sink in." Mr Scadding, who has three grown-up children from his first marriage, is currently out of work, and had been looking for temporary driving contracts. His wife runs her own marketing business from home. She said: "There is quite a lot of pressure involved in running your own business, and I've been working 12-hour days recently. This win means I can take my foot off the pedal and relax a bit." Mr Scadding said his first purchase would probably be to replace his Citroen C5 with a Range Rover Sport. They plan to move to a bigger house, but say they will probably stay in South Wales, although they may also buy a holiday home. They also intend to splash out on holidays in Barbados. 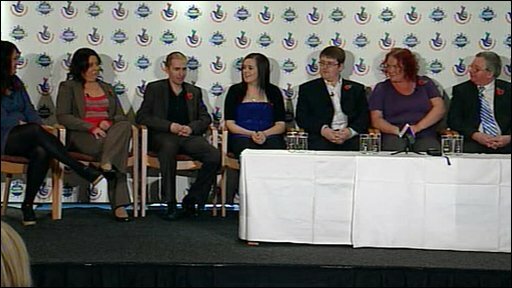 The couple are thought to be the seventh set of Lottery millionaires to come from Gwent in the past three years. Until now, the biggest single win was by Angela Kelly, from South Lanarkshire, who won more than £35m (39m euros) in August 2007. The winning numbers on Friday were 19, 43, 45, 34, 11 and the Lucky Star numbers were 5 and 9. Have you won the lottery? How did the win change your life? Tell us your experiences using the form below.